Watch this video (right) for a more detailed discussion, but in short the majority of these issues are a result of things in your stomach not being processed and moved along as rapidly as they should. 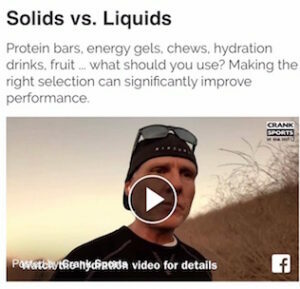 The solution to most of these issues is sticking with liquid carbohyrates (energy gels with water or hydration drinks), using complex carbs and avoiding simple sugars, and making sure you have enough fluids to keep everything moving through the osmosis process. Artificial sweeteners also are a common culprit as they are typically designed to be used in small amounts in diet foods. However, some sports drinks use artificial sweeteners in large quantities, and then the athlete consumes large amounts of the drink. Some people can handle this, but in others the results are not pleasant. e-Gel and e-Fuel are designed with this in mind and are loaded with complex carbs and very little simple sugars and no artificial sweeteners.